What is the CARES Team? The CARES Team is a program within the Spokane Fire Department that is in place to interact with citizens who have received a response from fire personnel and are identified as needing social service or other support system assistance. Generally the citizen needs help that is available through existing social services programs, but the individual was not able to access them through traditional means. In most cases, FD responders find these individuals feeling isolated or are in some type of crisis and don't know where to turn for help. Often, these citizens generate many 9-1-1 calls for assistance. 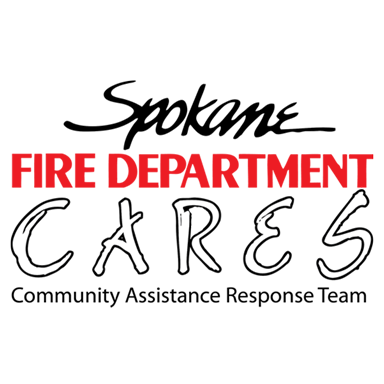 CARES was founded in 2008 by the Spokane Fire Department in conjunction with Eastern Washington University. The team is composed of Eastern Washington University students who are majoring in the Social Work degree programs. These students meet their academic practicum requirements by serving the CARES Team as student Interns. The Interns are overseen by the Social Response Manager, who is a 3/4 time employee of the City, hired in cooperation with EWU. CARES Team members normally serve an entire school year (September through June), but may work through the summer as well. They undergo orientation and training that helps them to become knowledgeable about local community agencies, diversity issues, and vicarious trauma. Team members are also trained in crisis intervention and experience ride along time with FD response units to experience firsthand the circumstances faced in the field. What Does the CARES Team Do? CARES works in collaboration with the Spokane Fire Department to assist vulnerable populations who face barriers in identifying and utilizing appropriate community resources. The CARES Team visits individuals in their home, works with them to identify their needs, advocates with them and connects them to appropriate resources. Why CARES? CARES was implemented in order to strengthen community relationships, decrease 9-1-1 over-users or abusers, decrease on-scene time for engine companies for social service calls, decrease level of frustration with front line crews, provide an expanded scope of care, and a higher level of service to customers of the Spokane Fire Department. Each time an EMS incident is initiated, a minimum of one fire engine with 3-4 firefighters and one ambulance, with 2-3 Paramedics arrive on scene. This call costs the City of Spokane approximately $750 per incident. CARES impacts the Spokane Fire Department in a positive and professional manner while assisting customers and community services.